Thanks again for visiting our website and taking the time to do your “due diligence” and research on such an important, and potentially life-saving decision. We are Lifesaver Storm Shelters of North Alabama, serving the greater Northern Alabama area and approximately a 150 mile radius from Huntsville. We are currently in the process of putting the finishing touches on our New Showroom in East Huntsville (as you can see in the pics above), to provide our customers with an even better storm shelter shopping experience so you can touch and feel the different types, makes and models we offer to meet you and your family’s severe weather protection needs. Be sure to follow us and “LIKE” us on facebook to make sure you get the latest updates on when that building will open, along with additional special offers or new products we come out with (several exciting things in the works as I type!). We’ve been in business for nearly 30 years in the Huntsville area, having developed, built and worked on hundreds of homes and subdivisions, commercial buildings and the like throughout Huntsville and the surrounding areas over the years. We’ve been operating under the Lifesaver Storm Shelters of North Alabama dealership since 2007 and pride ourselves on being able to combine low prices with the highest quality installs, to ensure the satisfaction of our customers. The storm shelter manufacturers whose brands we represent, sell and install, have all been in business for over 15 years and are the best products in the industry today, bar none, which is why they are the only storm shelter products and brands we offer, to ensure our customers’ and their families’ safety. We got into the storm shelter business after realizing the real need for people here in the infamous “Dixie Alley” for protection from severe weather and particularly damaging tornadoes. April 27th, 2011 was a big wake-up and hopefully has opened the eyes to many people who were caught completely off-guard without any severe weather plans or place to go to get safe. Complacency is a difficult thing to get past, however, by simply having one of our affordable, safe and high-quality storm shelters installed, one can sleep soundly at night knowing they have somewhere safe they and their family can go when severe weather next approaches. The truth is, severe weather and tornadoes can form in this part of the country at any time of year, like on the day after Christmas like we had two years ago, on Labor day like we had last year, or in April or November when we most commonly experience severe weather here in Northern Alabama. The storms can develop at day or night, and contrary to what many still frequently espouse, it doesn’t have to be “your time” to go. It’s just like having a Life Insurance policy – hopefully you’ll never have to use it, but if you do, it’s there for your protection and the benefit of your family. 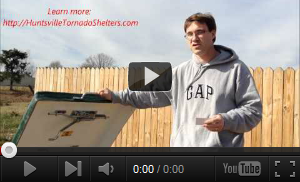 We’ve put a lot of time and energy into developing this website, complete with articles, photos and videos to provide as much information as we can about tornadoes, storm shelters, install guidelines, sizing requirements, how to determine the right storm shelter for you, and so much more (like our video responses to some of our most frequently asked questions) and we’ll continue to update and add additional information and products to meet the needs of our customers and fellow residents. We invite you to fill out the red form on the right side of the page so you can get even more information along with some very useful severe weather resources – FREE. Go ahead and fill out the form now. If you need to contact us, click here. Thanks again for visiting our website and doing your “due diligence” to keep your family safe. We appreciate you and hope you’ll do business with us. this is a awesome product that you have. this shelter could definitely save many lives in any terrible storm.